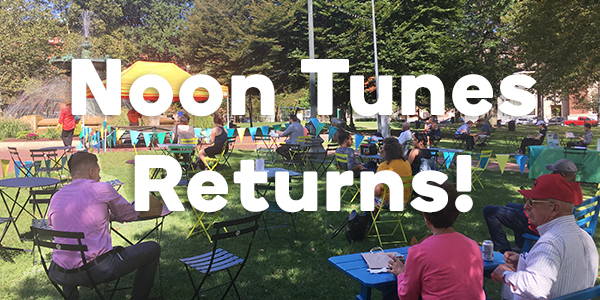 Our summer programming season kicks off on Wednesday, June 6 with the return of Noon Tunes. Join us in Burnside Park every Wednesday through the month of June for free live music during your lunch break. Czésare Santana joined us twice last summer, and we are so excited to welcome him back to Burnside Park to kick off our Noon Tunes series. Czésare is a Latin Alternative Bachata, Folk, Fusion Singer/Songwriter. Born in the Dominican Republic and raised in New York City, Czésare combines the music of his Latin roots with powerful and moving lyrics. Michelle Cruz has performed before on our Noon Tunes stage, and as part of Afrimanding on our Burnside Music Series stage. Michelle is a singer/songwriter who blends jazz, folk and rock in her music. She has opened for Judy Collins, and was asked to pay tribute to the late folk singer Odetta at a 2010 MLK Day Celebration. The Hapax Trio is comprised of Samuel Brunner on guitar, Antonio Forte on piano and Brian St. Pierre on drums. The trio explores contemporary music with a heavy emphasis on experimentation, contemplation and improvisation. A trio without a bassist, they are challenged to redefine what it means to be a jazz trio in the creative and logistical sense. Miss Wensday returns to the Noon Tunes stage to close out our June series. A singer and songwriter, her performances weave jazz standards with rock, tango and blues. Noon Tunes runs from 12pm – 1pm. Noon Tunes will return for another series of concerts on Wednesdays in September in a special series sponsored by The Dean Hotel. Bring your lunch and find a chair under the trees, or pick something up for one of the food trucks. On the schedule for Wednesday afternoon is Incred-a-Bowl, Poco Loco Tacos, Portu-galo, and Red’s Street Kitchen. Please note that our food truck schedule sometimes changes without notice, follow us on Twitter for any up to date announcements. Click “Interested” on our FB event and stay up to date on each week’s performance.